Defense Rests In Zimmerman Trial; Race 'Permeates The Case' : The Two-Way As the high-profile trial of the man accused in the death of Trayvon Martin nears its end, race hasn't been talked about in the courtroom. But the issue is running through the case, legal experts tell NPR. The defense is expected to wrap up its case Wednesday afternoon at the murder trial of George Zimmerman, the Florida neighborhood watch volunteer accused in the February 2012 shooting death of teenager Trayvon Martin. After its motion to acquit Zimmerman was denied, his defense team rested its case. Their final witness was Zimmerman's father, Robert. The defendant did not testify. "In one memorable moment Wednesday, attorneys from both sides grappled with a foam dummy on the floor of a Florida courtroom," CNN reports, "working to demonstrate to rapt jurors their competing versions of what happened the rainy 2012 night Trayvon Martin died in an altercation with George Zimmerman." USA Today has also isolated that video on its website. Closing arguments are expected Thursday. The case could be in the hands of the sequestered jury by late Thursday or early Friday. 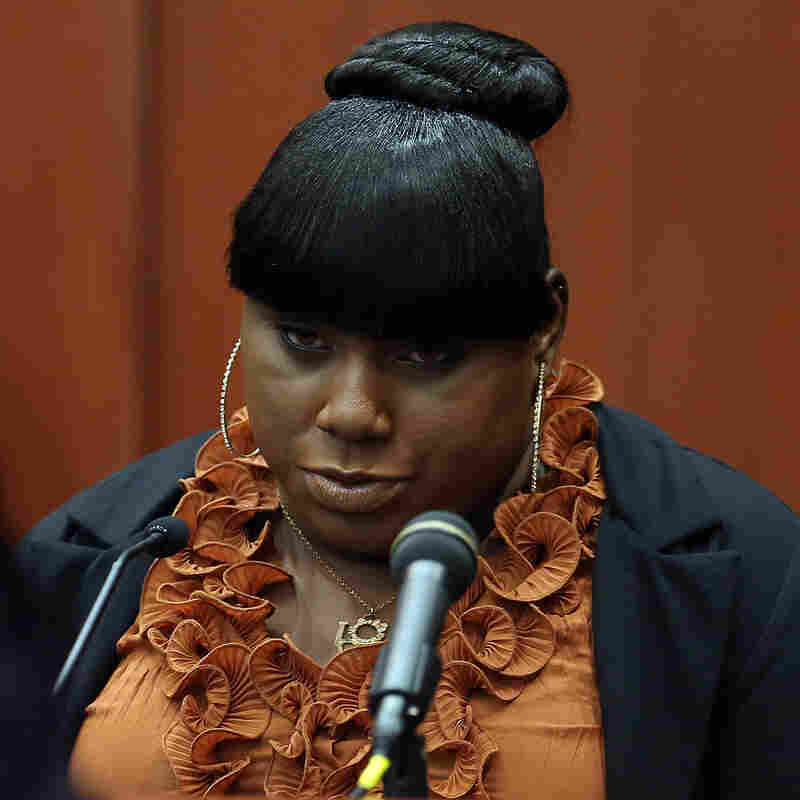 Trayvon Martin's friend Rachel Jeantel testifies in the murder trial of George Zimmerman. Her testimony sparked discussions of the racial issues involved in the case. "The judge in the George Zimmerman murder trial issued key rulings this morning, blocking the defense from putting on testimony about 17-year-old Trayvon Martin's text messages or using a computer animated recreation of the teen's shooting as evidence. The defense will be allowed to use the animation as a demonstrative aid, likely during closing arguments. But it will not go back with the jurors as evidence when they deliberate." As we've written many times, Trayvon's death and the way authorities handled the investigation reignited a national discussion about race relations. The 17-year-old was killed on Feb. 26, 2012, in Sanford, Fla. Zimmerman had called police to say there was a "suspicious" person in the area. At some point, the two came into contact. Zimmerman says he shot Trayvon in self defense, after the younger man attacked him. Trayvon's family members and their supporters say Zimmerman racially profiled the African-American teen and should not have followed him. They also dispute Zimmerman's claim that he was defending himself. Anger over the fact that authorities didn't immediately arrest Zimmerman led to protests in Florida and in cities across the nation. Wednesday on Tell Me More, former federal prosecutor Pamela Pierson told host Michel Martin that during the trial so far, "race is the 500-pound gorilla in the room that nobody is talking about. [But] I think it permeates the case — it has from the very beginning. The furor about whether Zimmerman was going to be charged. ... And despite the judge's and the attorneys' efforts to keep racial or racist language to a minimum or out of the courtroom, I think it definitely is permeating the case." Pierson, now a professor at the University of Alabama School of Law, said she saw race entering the picture particularly in the reactions to the defense attorneys' cross examination of Trayvon's friend Rachel Jeantel. Defense attorneys, she noted, try "to destroy someone's credibility. ... That's their job — to attack their credibility. But we wouldn't be hearing 'Oh this was unfair' or 'this is racially biased,' [if the witness had been] a thin, white, well-spoken woman" instead of the African-American Jeantel. "It's a kind of lousy murder case because for murder the prosecution will have to prove what's going on in Zimmerman's mind. That he was malicious. That he hated Trayvon. That he had all this ill will. And I'm not sure we've seen a lot of evidence of that. "On the other hand, it's a pretty good manslaughter case. And the jury will have the option, almost certainly, of convicting him of that. Because for manslaughter, all that has to be proved is that Mr. Zimmerman was reckless, that he's kind of a loose canon. And I think we've seen plenty of evidence of that." Click here to find an NPR station that broadcasts Tell Me More. Closing arguments are likely to begin as soon as Thursday.